Todays Inspired by post is by one of my favourite art movements the pre-raphelites brotherhood, the deep velvety colours and floral patterns are a must in any Pre-Raphaelitet painting. I could talk about my love for their creations for hours, but I shan’t bore you. They were the reason why I lived the bohemian lifestyle when I was at university down in cornwall, my best friend has the perfect Pre-Raphaelite look, long hair, she would always wear floral layers and we would paint for hours in our studio. I do love remembering those moments. I think I will always have an infinity with the art and the movement. The clothes are subtle versions of what kelly use to wear, its all about the deep colour and details. Previous Post a note from me to you. I love the Pre-Raphaelites. I went to see the exhibition in London and found it so fascinating and inspiring, I really want to get back into painting now. I think how I draw and what I wear or how I style myself is influenced by them. Love the colar necklace. 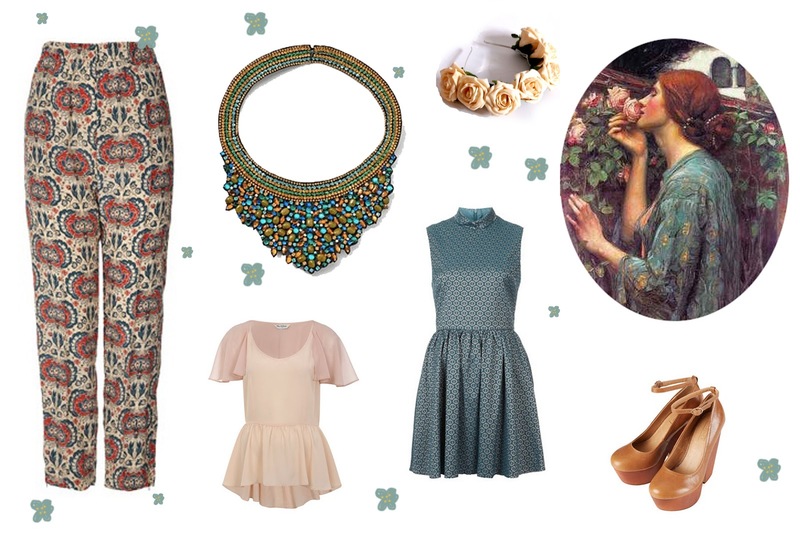 i looovvveee the Pre-Raphaelite movement! its all so beautiful, i did one of my photographic projects about it last year. ella how did you know that i've been lusting after that blue dress, it's so stunning!